What today is Mackinaw City Michigan saw its first European in 1633 - Jean Nicolet - sent out from Quebec City by Samuel de Champlain. The first settlement here occured in 1715 with the construction of Fort Michilimackinac. Over the next century, the area traded hands between the French, British and Americans. Its a bit generous to call this community of less than 1,000 a 'city'. It is however, one of the most popular travel destinations in Michigan. It boasts two fine marinas and sufficient services to look after the needs of most sailors. 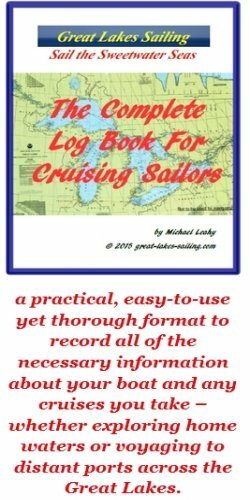 Mackinaw City Michigan can be quite busy in the summer, especially following the Chicago - Mackinac Race and the Port Huron to mancinc Race. Mackinaw City Michigan is a tourist town and the large Mackinaw Crossings shopping mall underlines that! The approaches to Mackinaw City Michigan are clear from all directions. There are two basins forming Mackinaw City harbor. The Municipal Marina is located in the northern-most basin. This basin is bounded by breakwaters on the north, south and eastern sides. The entrance lies on the northeastern corner. The outer breakwater pierhead is marked with a Fl GREEN light visible 5.8 nm. The inner pierhead is marked with a Fl RED light, also visible 5.8 nm offshore. Once inside the harbor, turn to port and proceed to the Municipal Marina, located on the west side. The southern basin is home to the Straits State Harbor. The harbor entrance is protected by two overlapping breakwaters. The entrance is on the south side, between these breakwaters. They are unmarked. From Mackinac Island, note the well-marked Majors Shoal. There are several other charted obstructions but none that would pose a threat to a prudent sailor. This harbor lies in the northerly basin. It has 104 slips with 75+ set aside for transient sailors. There is a fuel dock (diesel and gasoline) and a pumpout station. Water and power are available dockside. There are restrooms, showers, a laundry and chandlery. Other amenities include cable TV and picnic & BBQ areas. There is internet access. This harbor is situated in the southerly basin. They have 136 slips available for transient sailors. There is a fuel dock (diesel and gasoline) and pumpot station. Water and power are available dockside. There are restrooms and showers as well as laundry facilities. They also have picnic shelters and BBQ's. Sheplers Marine is located in the south basin. They are a full-service marine maintenance facility. They can carry out repairs on a wide range of engines, do fibreglass and gelcoat repairs as well as woodworking and painting. They have haulout facilities. There are a couple of grocery stores in the village where you can reprovision. There are several banks in Mackinaw City and all have ATM machines. Mackinaw City Medical Clinic (231) 436-9900 offers a walk-in service. The nearest hospital is 10mi / 16km north across the bridge in St. Ignace, MI - the Mackinac Straits Hospital (906) 643-8585. There is no pharmacy in Mackinaw City Michigan. The closest is Bay Pharmacy (906) 643-7725 8mi / 13 km north in St. Ignace, MI. There are enough restaurants and pubs in Mackinaw City Michigan to suit nearly everyone's tastes. A few to consider would be at the new Mackinac Crossings shopping centre where several restaurants are located. If you like Italian, try Nonna Lisa's, a few blocks from the harbor. Audies will actually send a limo to pick you up and bring you to their upscale dining room - and the dinner is worth the ride! The Lighthouse Restaurant and Lounge is close to the harbor. This is an AAA-listed dining establishment with fresh, locally-caught Great Lakes seafood on the menu as well as all-you-can-eat crab legs. The Icebreaker Museum is housed in the decommissioned USCG Mackinaw City. Built for service in WWII, she now lays in her namesake city and is open for tours and visits. Colonial Michilimackinac was built in 1715 as a fort and fur trading post. It played a hugely important role in the history of this region. There are on-going archaeological research digs and great childrens' programs here. All offer a real window into this important heritage site. Look at this Mackinaw City Michigan site to get an idea the many things happening in this popular destination.